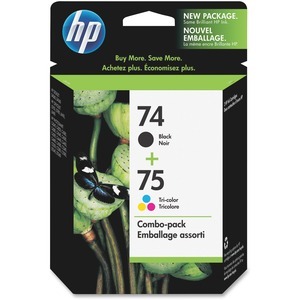 Ink cartridge combo pack includes HP 74 and HP 75 ink cartridges. Ink is formulated to consistently produce professional-quality documents at a great value. Count on durable prints from a cartridge specially designed to work with your Hewlett-Packard Deskjet D4260, D4360; Officejet J5740, J5750, J5780, J6450, J6480; Photosmart C4210, C4240, C4250, C4280, C4285, C4345, C4380, C4385, C4440, C4450, C4480, C4550, C4580, C4599, C5240, C5250, C5280, D5345, D5360 and C5580. HP 74 yields 200 pages. HP 75 yields 170 color pages.